There are many horticultural traditions associated with the holiday season. One is the Christmas cactus. The Christmas cactus is different from many other holiday horticulture traditions in that it is literally the gift that keeps on giving. Wreaths and trees dry up, poinsettias drop their colorful bracts, but there are Christmas cacti that are decades old, passed down from generation to generation. An article in the Bozeman (Montana) Daily Chronicle in 2009 documented a 145-year-old Christmas cactus that had been passed down in the family since the 1860’s when a forebearer brought the plant by wagon train to Montana from the East. This is the promise (and, potentially, the curse) of the Christmas cactus. If you have one you’ve inherited or want to start your own tradition, here are some of the keys to the care and feeding of this long-lived plant. Christmas – or Holiday, as they’re often generically called – cactus is fairly easy to care for. There are Easter, Thanksgiving, and Christmas cacti, which of course bloom in time for their namesake holiday. There are some subtle differences, however. Christmas cacti have flattened “leaves” (they are not true leaves, but rather modified stems) with rounded teeth on the margins, while the Thanksgiving cactus has pointed teeth. The Easter cactus has fibrous hairs in the leaf joints, along with pointed teeth on the margins. 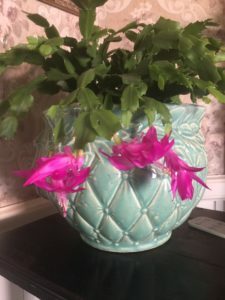 While the holiday cactus will flower at the appropriate holiday under normal conditions, sometimes florists will “force” blooming of one type of cactus at a different holiday, especially a Thanksgiving cactus into blooming at Christmas. So, what are those “normal conditions”? First of all, dispel those images of Christmas cactus blooming away in a desert somewhere. Holiday cacti originate in the rainforests of Brazil. They are a type of plant known as “epiphytes”, a plant which grows on other plants, although they are not parasitic. Orchids, air plants, and bromeliads are also epiphytes. In their natural habitat, holiday cacti lives in trees, or hang off cliffs, loosely rooted in organic matter (not soil). In the rainforest, 17 inches of rain per month is not uncommon, although during the dry season of spring, rains may only be 3 inches per month. As a houseplant, holiday cacti may be kept either in a garden, out of bright direct light (dappled shade preferred), porch, or, when temperatures are below 70 degrees in the day, in a bright room in the house with other houseplants. Fertilize regularly during the growing season, and prune in late spring/early summer to ensure a fuller plant. Use the trimmings to start new plants by sticking them in vermiculite to develop roots. Spritz with water until roots develop, in about three weeks. Voila, you’ve just created Christmas presents for your entire family! In order to have your holiday cactus blooming at its eponymous date (whether Thanksgiving, Christmas, or Easter), it helps to understand that the cacti are “short day” plants, which are stimulated to bloom when nights are longer than 14 hours, daylight is between six and eight hours long, for a six-week period. Even the tiniest amount of light: the shine of a street light through a window, or even a brief flash of car lights at night is enough to interrupt the dark cycle and disrupt bloom development. Keeping light off the plant during the dark period is the biggest challenge, one that was less of an issue decades ago than it is today. Keeping the cactus in a cool area with temperatures in the low 50’s will also encourage bloom. Finally, stop fertilizer applications by September to harden off the stems and help kick the plant into flower production. Once flowering, keep the plant in a room with bright light and day temps in the 70s, and night temperatures in the 60s. Water frequently, but allow the planting media to dry out slightly between waterings. If blooms fail to open or drop, it may be due to low humidity, low soil moisture, or an abrupt change in light or temperature. For healthy, long-lived cacti, use a potting media that drains well and allows for good aeration. Peat moss, perlite, and cocoa fibers are all potential media for potting. Over time (say, four to five years), the potting media will break down and lose it’s aeration, and may actually become toxic to plant roots. Invest in good potting media and pots that provide room for the cacti to grow for a few years. The biggest problem with holiday cacti is overwatering and poorly draining soil, resulting in rotten roots. If you should receive a Christmas cactus as a holiday gift this year, perhaps your descendants can keep your memory alive through caring for this special plant for decades to come. • What to Do With Holiday Plants, Now That the Holidays Are Over!